The March quarter National Accounts data released yesterday surprised on the upside with quarterly growth at 0.9 per cent, but as some commentators have noted there remains a downside risk over the next 12-24 months from much lower capital expenditure than once expected (see comments from Capital Economics’ Daniel Martin reported in Business Day). 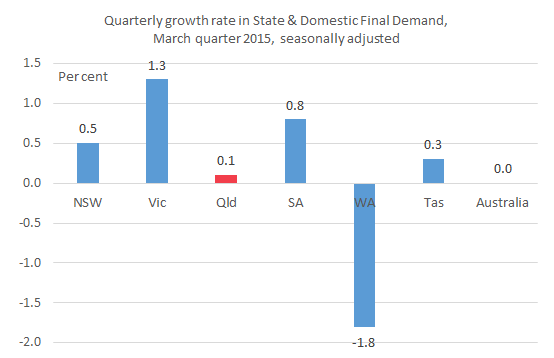 The new National Accounts data also give hope that Queensland’s technical recession may not extend into 2015 after all, with State Final Demand slightly growing in the March quarter, although at a much lower rate than in NSW and Victoria (see chart above). While the fall in resources sector capital expenditure is a big drag on the State economy, Queensland has benefited from a surge in residential dwelling investment, a good rate of consumption growth, and a big increase in investment by the State and local governments in March quarter. Once Queensland’s recent strong export performance is considered, noting it is not including in the State Final Demand figures in the chart above, there is reason to be positive that Queensland is enduring the end of the mining boom as well as could be expected. On Queensland’s recent good news on exports, see the excellent National Accounts: State Details brief produced yesterday by Queensland Treasury’s Ryan Faulkner. On the March quarter National Accounts, I’d also recommend Pete Faulkner’s commentary GDP surprises on the upside. QLD returns to growth. Note that, in the chart above, domestic final demand is shown as 0.0 per cent for Australia in March quarter. This can be reconciled with the reported GDP growth of 0.9 per cent by recognising that the domestic final demand figure does not take into account net exports or changes in inventories/stocks, which were both major contributors to Australia’s surprisingly good rate of economic growth in March quarter. This entry was posted in Macroeconomy, Mining and tagged australia, gdp, nationalacounts, qld, queensland, sfd. Bookmark the permalink. Thanks KT. Let’s hope so.